(Nanowerk News) Graphene nanoribbons formed into a three-dimensional aerogel and enhanced with boron and nitrogen are excellent catalysts for fuel cells, even in comparison to platinum, according to Rice University researchers. A team led by materials scientist Pulickel Ajayan and chemist James Tour made metal-free aerogels from graphene nanoribbons and various levels of boron and nitrogen to test their electrochemical properties. In tests involving half of the catalytic reaction that takes place in fuel cells, they discovered versions with about 10 percent boron and nitrogen were efficient in catalyzing what's known as an oxygen reduction reaction, a step in producing energy from feedstocks like methanol. The research appeared in the American Chemical Society journal Chemistry of Materials ("Boron- and Nitrogen-Substituted Graphene Nanoribbons as Efficient Catalysts for Oxygen Reduction Reaction"). Ajayan's Rice lab has excelled in turning nanostructures into macroscopic materials, like the oil-absorbing sponges invented in 2012 or, more recently, solid nanotube blocks with controllable densities and porosities. The new research combines those abilities with the Tour lab's 2009 method to unzip nanotubes into conductive graphene nanoribbons. Researchers have come to realize that graphene's potential as a catalyst doesn't lie along the flat face but along the exposed edges where molecules prefer to interact. 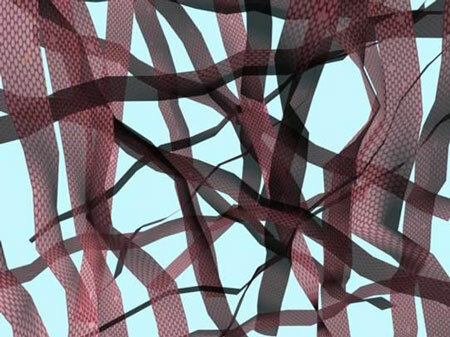 The Rice team chemically unzipped carbon nanotubes into ribbons and then collapsed them into porous, three-dimensional aerogels, simultaneously decorating the ribbons' edges with boron and nitrogen molecules. The new material provides an abundance of active sites along the exposed edges for oxygen reduction reactions. Fuel cells turn hydrogen (or sources of hydrogen like methane) into electricity through a process that strips electrons at one and recombines them with hydrogen and oxygen where the circuit closes. The primary waste products are carbon dioxide and water for methanol or, from hydrogen, just water. The reactions in most current fuel cells are catalyzed by platinum, but platinum's high cost has prompted the search for alternatives, Ajayan said. "The key to developing carbon-based catalysts is in the doping process, especially with elements such as nitrogen and boron," he said. "The graphitic carbon-boron-nitrogen systems have thrown many surprises in recent years, especially as a viable alternative to platinum-based catalysts." The Rice process is unique, he said, because it not only exposes the edges but also provides porous conduits that allow reactants to permeate the material. Simulations by Rice theoretical physicist Boris Yakobson and his students found that neither boron nor nitrogen doping alone would produce the desired reactions. Testing found that optimized boron/nitrogen aerogels were far better than platinum at avoiding the crossover effect, in which fuel like methanol permeates the polymer electrolyte that separates electrodes and degrades performance. The researchers observed no such effect in 5,000 cycles.